Hyperacute T waves are tall, broad based and more symmetrical than normal. There is no absolute size that is too tall to be normal, as it depends on the size of the QRS. It has been suggested that a T:QRS ratio greater than 0.33 in V1-4 is abnormal. A T/R ratio has also been described. T waves in V4-6 should never be taller than the R wave. 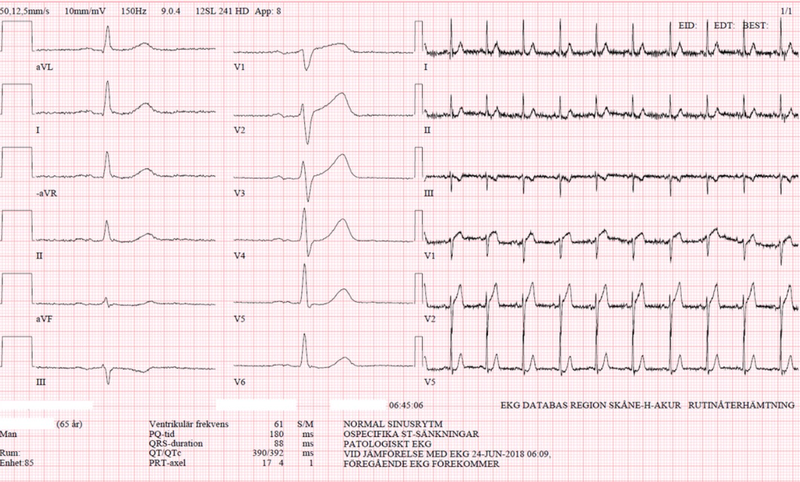 If in doubt, compare with a previous baseline ECG. Hyperacute T waves can be the first sign of coronary occlusion. They localise to the affected artery distribution and can have reciprocal changes. They may also occur with Prinzmetal angina, or when the ST segments are on the way back down again after reperfusion. This ECG is from a middle aged man who presented with chest pain. This was the repeat ECG 10 min after arrival. This ECG shows anterior hyperacute T waves. Earlier ST elevation has all but resolved, likely due to transient reperfusion. The cause was a 100% proximal LAD occlusion. This ECG is from a man in his 70s who had 2 hours of chest pain that started at rest.